Highly Recommended: FIGHTER IN VELVET GLOVES: ALASKA CIVIL RIGHTS HERO ELIZABETH PERATROVICH by Annie Boochever with Roy Peratrovich Jr.
"You're an Indian, aren't you? Roy answered, "Yes, I am." "Well, I'd like to help you, but other people around here don't want me to rent to Indians." When most people think of civil rights, their thoughts turn to the 1960s. They may remember photographs of Martin Luther King and others who spoke, marched, or participated in sit-ins. Some people, however, have a different memory of people fighting for civil rights. Their memories are of the 1940s when Native Alaskans fought for their rights. 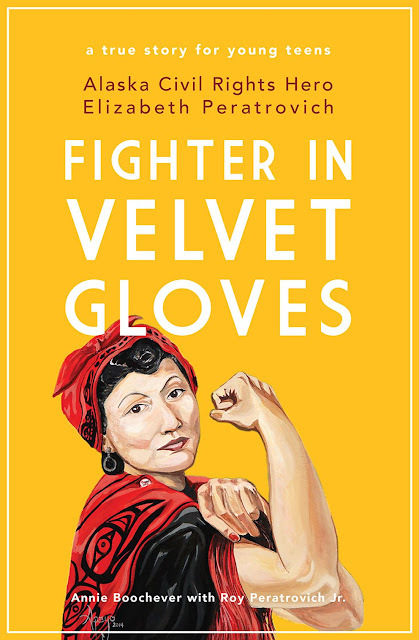 Encounters like the one at the top of this post are in Fighter in Velvet Gloves: Alaska Civil Rights Hero Elizabeth Peratrovich. Due out on February 16, 2019 from the University of Alaska Press, it is definitely going to be one that I recommend over and over for its history of the civil rights work in Alaska, its use of Tlingit words throughout, and of course, because it is about a Native woman. Photos throughout are exceptional. On July 4, 1911, in the Southeast Alaska community of Gánti Yaakw Séedi (Petersburg), Edith Tagcook Paul from Deishú (Haines) gave birth to the baby girl who would grow up to be Elizabeth Jean Peratrovich. Over thousands of years they developed cultures and a way of life especially suited to their Haa Aanî, or homeland. Peratrovich was fluent in both, English and Tlingit. Her Tlingit name was Kaaxgal.aat. In 1912 a group of Native people from Southeast Alaska gathered in Sitka and formed the Alaska Native Brotherhood (ANB) and two years later, the Alaska Native Sisterhood (ANS). Elizabeth's father was a founder of the ANB, which is now recognized as the oldest Indigenous civil rights organization in the world. The organizations worked to improve educational opportunities, employment, social services, health services, and housing. 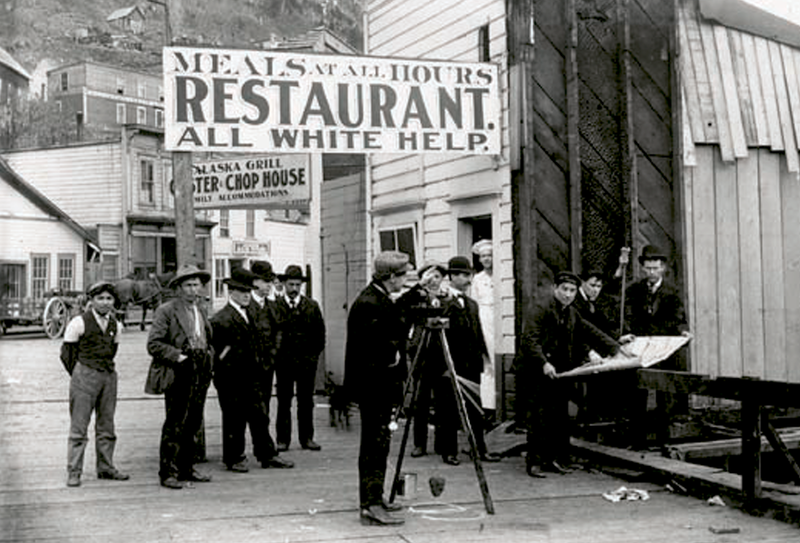 Historic sign, Front Street, Juneau, circa 1943. Alaska State Library. Winter and Pond Collection. ASL-PCA-1050. Some chapters include examples of societal racism. In one, you'll learn about schools where only white children could attend. In another, you'll learn that during World War II, almost 9,000 Alaska Native people were forced to leave their homes because the US Army thought that destroying their villages would make it harder for the Japanese to invade that part of Alaska. You'll learn that Native Alaskan men were in the armed services--but prejudicial ideas about Native women led the army to issue an order prohibiting soldiers from associating with Alaska Native women, even if the woman was part of the soldier's family! The chapter on voting has a page called "The Toilet Paper Defense" that is stunning. There's other parts of the book that are intimate, personal looks at Elizabeth Peratrovich. She was adopted and did not know her birth mother. But that woman knew Elizabeth and, it seems, wanted to be near her. I won't say more about that, but it is a sad point in the story. I highly recommend Fighter in Velvet Gloves. Some readers will be uncomfortable to read about the racism directed at Alaska Native people. Accounts like these mess with the idea that this country is exceptional, that it is (or was) "great." These accounts have received very little attention in children's or young adult literature--but they're very important. Change is possible, but only when problems are identified and made visible. I'll end with some words in Chapter 14, titled "Carefully Chosen Words." It is about her speech on the day the Alaska legislature was debating the anti-discrimination bill that would be signed long before the US Civil Rights Act was passed. That day, she wore velvet gloves. Elizabeth took a deep breath. She felt she was ready, but would her words have any effect? She looked at Lori and thought about what kind of life her daughter would have with those ugly signs plastered around town. She thought of the birth mother she never knew, and of her dear adoptive mother, and prickled at the racism they surely must have suffered. She thought of her adoptive father, Andrew, and about how kind he was and how powerful his sermons were. Words were the tools that had served her all her life, and she and Roy Sr. had spent hours thinking about just the right ones for this occasion. Now was the time. Labels: Annie Boochever, Fighter in Velvet Gloves: Alaska Civil Rights Hero Elizabeth Peratrovich, Pub Year 2019, recommended, Roy Peratrovich Jr.